BNEF on Friday released a damning report on the cost of new ultra-supercritical coal-fired power stations in Australia – which the Coalition likes to call “clean coal” – which basically confirms the theory that this would be “the most expensive form of new energy supply” the federal government could possibly choose to invest in, even discounting future carbon liabilities. As for the cost of coal with carbon capture and storage technology added – which many, including Australia’s chief scientist, have said will be the only way new coal could be built, if we are to abide by our national and internaitonal emissions reduction commitments – BNEF says this is difficult to assess, but comes up with an LCOE in the ballpark of $A352/MWh – or around three times the cost of wind or solar. According to BNEF, building new coal in Australia would result in “substantially higher” electricity prices than we would see from a combination of wind, solar and gas – provided gas markets operate efficiently. “New coal is made particularly expensive due to the substantial carbon, reputation, trading and construction risks the technology presents to an investor,” explains Leonard Quong, a senior associate with BNEF in Sydney and the report’s lead author. On the subject of emissions, BNEF’s research also found that new-coal is far from ‘clean’, with new ultra-supercritical plants found to have an emissions intensity of 0.76tCO2-e/MWh – around double that of combined cycle gas (0.37-0.46tCO2-e/MWh). “It is inaccurate and misleading to describe ultra-supercritical coal technology as “clean” without the presence of CCS,” said Quong – and as noted above, adding CCS to the cost of the technology takes it from unrealistic, to out of this world. Of course, BNEF is not alone in coming to these conclusions. The director of the Centre for Climate Economics and Policy at the Australian National University, Frank Jotzo, put them in his own words in this Conversation article today; while earlier this week the Melbourne Energy Institute’s Dylan McConnell also crunched the numbers, and found that the Coalition’s clean coal plan would cost $62 billion – and that for a reduction of just 27 per cent of coal power emissions. Based on the latest estimates from the CSIRO, McConnell said that achieving the 27 per cent reduction would require 20GW of new coal capacity, at a cost of $3,100 per kW to build. “No wonder no one wants to talk about the costs,” McConnell told The Guardian. He said the total cost of the exercise, $62 billion, could instead build between 35GW and 39GW of wind and solar energy, amounting to an emissions reduction of between 50 – 60 per cent in the electricity sector as a whole. In another scenario, where the 27 per cent emissions reduction was achieved with renewables, rather than with new coal, about 13-19GW of renewable energy would be needed, which would cost between $24 billion and $34 billion. Australia’s chief scientist, Dr Alan Finkel, has also cast serious doubt on the viability of new coal for Australia. Finkel, who is conducting a national energy security review for Turnbull, was “less effusive” about the high-efficiency, low-emissions coal generation in comments made at a meeting in Brisbane on Thursday night, according a report in the AFR, and keen to lay down some home truths about the technology. “What we need, if we are going to look at coal, is effectively, truly clean coal,” Dr Finkel said. “So these modern technologies, coupled with CCS [carbon capture and storage], can be very effective not only in the interim, but in the long term,” but will have to compete with other lower-emissions technology, such as wind, solar and hydro, to be part of Australia’s future energy mix. Further, Finkel would not back taxpayer moneys being used to fund development of the technology – a path senior Coalition ministers yesterday suggested the party would be more than happy to take. “Coal can only compete if they show they are truly low emissions,” he said. Finally, Finkel also debunked Turnbull’s argument that Australia should do “clean coal” because Japan is: “Japan is in a different situation because they are taking nuclear out of the mix. They are in a situation where they are facing demand growth,” he said. Of the subject of debunking myths, BNEF also addressed Turnbull’s argument – one rolled out regularly by the Coalition, and repeated in the PM Press Club speech on Wednesday – that we need new coal generation because Australia’s grid “will need more synchronous baseload power” as old coal generation is gradually retired. Umm, no, says BNEF, there is no need for new baseload coal generators, because while they are “an important legacy part of today’s power system, the role of “inflexible, fossil-fuelled generation” will decrease in future, says the report, and instead will increasingly become a costly liability for power generators. “In the grid of the not-too-distant future coal’s baseload operation becomes a curse, not a blessing,” says Quong. “The fundamental control paradigm of grids is changing from baseload-and-peak to forecast-and-balance. The balancing component will require more flexible or firming capacity, not baseload. Gas-fired generation is much better suited to providing flexibility to the system than coal, and can provide this at a much lower cost. “Whilst we estimate that 19.1GW of coal capacity could reach the end of its technical life by 2040, a combination of gas and renewables is the lowest-cost option to replace this generation and maintain secure energy supply in Australia”, he said. RE once reported on how enthusiastic Malcom appeared after his first Tesla S drive. Maybe Mal has his own economically Ludicrous Mode … push his Donation button. Must have been the Evil Twin ! Ah, like the two Costellos? Perhaps he’s since been re-programmed Westworld style? One of the good things about a growing number of voices saying that same thing, is that if the Government chooses not to listen, there will be plenty of evidence to use against them. More reports from independent sources seem to be appearing that are both critical of less-dirty coal and encouraging of renewables. One hopes that a point of critical mass can be reached before the Government commits too far to the opposite direction. Seems the RWRNJs who control Turnbull are impervious to reports such as this one – at our expense, they live in their own world when it comes to the renewable energy future. Yeah, it is frustrating to see such talent waste so much time thinking about coal at all, because when they go looking for finance to proceed they’ll find a very lonely market. Just move on and put that time and effort into developing renewables and improving storage already. They have one objective – funneling our money to themselves and their FF mates as fast as possible for as long as possible. All of the arguments about helping the poor, energy security etc are just window dressing to keep us talking instead of acting. Wrong on that one Ron. Clean coal is the stuff you leave in the ground. I’m all for renewables, but simply reporting one selected part of the story is just not fair. Renewables are only really useful if they can provide power all of the time. Solar, wind etc can’t do that without storage of some way or another. That costs more money and should be included in the figures for building renewables. As for spending money, we have had a number of good starts on technology that addresses these issues (Wizard Power had a couple of these and some great ideas on fabrication). It would be better to spend a few million dollars ironing out the issues with that technology than chasing the dirty white rabbit down the other hole. We would then have something to market to the world. Is there a problem commencing with the mere concept of storage ? It seems some commenters would be happy to rule it out, never doing LCOS sums because they are aghast about storage economy figures from several years ago.This blind spot surely does not apply to RE commenters.Maybe some would prefer to build a gas peaker, or a dreaded ultra super-hypocritical coal generator, because they perceive it to be ‘always on’ and fantasise their output can’t be affected by events like the SA tornadoes in 2016. They’ll be stuck with that generator for 40 years.Given the asset lifespan and considering the descending storage cost curve, we can reconsider which will be more economical in 5, 10 or even 20 years. It is likely more economical to anticipate and plan for emerging technology, like storage and microgrids. Here’s a thought: water heating in Australia is about 90 petajoules ( 25TWH) a year. This would represent a vast smart load opportunity and could be compared directly with battery storage. That’s 5 million powerwalls! Totally agree. Now we just need a ‘smart network’ to optimise when/where to direct surplus renewable power into this massive already-existing nationwide battery. But all up this would be much less than half the storage problem solved – we still need the rollout of residential and commercial premises Powerwall storage (or similar competitive products) and these also to be on the ‘smart network’, to achieve the other half of our storage req for 100% renewable energy. All of this technology is here (and been here for years and getting cheaper by the month) all we need to do is deploy it. I’ve already had that thought. I’m building a house (frustratingly slow process), and we will have 7KW solar panels with 11KWh on-grid storage. When the batteries are full or are charging at the maximum rate and there is energy which would be sold to the grid, then rather than selling it, it will super-heat our hot water to around 80 degrees. We will have a big 400L hot water tank. Then when there is not surplus power we will only use our batteries (or if they are flat, buy from the grid) to heat our hot water if it falls below 60 degrees. Right on – cooperatively timing or deferring consumption is better than a battery and essentially free, 100% efficient and doesn’t wear out. This could go a long way to minimise the anout of gas (or other fuel) needed to back up a renewable dominated grid when it’s calm and cloudy. We refer to it as ‘camping at home’ when the solar is too useless to recharge the batteries substantially during the day. Other Ian, Sophie’s article is pretty balanced I’d say. The key is changing from Baseload-and-peak to forecast-and-balance. Why does that old furphie CCS keep cropping up? Is that even a thing? The ultrasupercritical coal plant will produce 0.76 tonnes of CO2 per MWH 44g of CO2 is 22.4l so 1MWH will be 17 000m3 of pure CO2. 20 GW of coal capacity would produce 20x 24x(365)x.85=150TWH a year = 2 550 000 000 000m3 of pure CO2 a year. Do that for 40 years : 102 000 000 000 000m3 of CO2 that’s 102 000km3 of gas. It’s said housing bubbles are bad what about this huge bubble? Try shoving all that underground. By the way Australia’s gas reserves are 4 thousand billion cubic meters. 4% of this volume of CO2. The other issue is the cost of utility scale wind and solar that’s now about $1000/KW $62billion should buy 62GW of wind or solar. Gas plants might be dispatchable but for large scale gas in the GW range how economic is intermittent gas demand v/s continuous gas supply? Can a gas supplier be expected to build gas distribution infrastructure to service a large generator which may be called on to run 10% of the time. Not to mention you need to divert about 30% of a plant’s output to the process of carbon scrubbing, liquidification and pumping to reservoirs. The only other scheme that seems up there in stupidity is the current Victorian government’s thought bubble that conversion of brown coal to hydrogen for export to Japan might be a good thing. No problem down here in Tassie. Any renewable energy not being generated can be instantly replaced by turning on a hydroelectric turbine, and if the sun starts shining or the wind starts blowing, a hydroelectric turbine can be turned off to preserve the water for later. The only problem is that, although our hydro storages are literally rechargeable batteries, they cannot be recharged by us – only by the rain. Therefore the above only works if the storages are maintained at relatively high levels, otherwise we lose our flexibility. None (to my knowledge) of the Tassie hydro assets are set up for pumped storage. How technically feasible would it be to convert them over? If they were, and investment was made in the HVDC link to boost capacity, Tassie would become a significant rechargable battery for the nation. I know that one hydro asset in the Snowy Hydro scheme is running as a pumped storage facility. Very difficult. The “downstream” storages in Tassie are either very small, or a long way away from the large upstream storages. Tumut 3 in the Snowy is the pumped storage – Talbingo Dam is huge – this is by far the biggest dam in the Snowy. Water is pumped from a small storage above Blowering Dam up to the top of Talbingo Dam. It was a huge engineering effort – 172 metres high earth rockfill. You’d struggle to ever finance such a thing today. a) more renewable energy is being generated than what is being used in Tassie plus what can be exported through Basslink (ie, all hydro stations can be turned off). Tassie’s minimum use is about 800MW, and 600MW can be exported through Basslink. We currently have about 300MW of renewable capacity, so we could potentially install another 1100MW. The caveat to this is that for approx. 6 weeks per year we have a water “surplus”, when many dams are spilling regardless of if they are used or not. At these times any extra renewable energy will be wasted. b) the dams get low. Then we may still potentially have power shortage when the renewable energy is not being generated. Undoubtedly there is a need for storage. Presently there is pumped hydro with the Snowy Mountains Scheme and to my knowledge not much else. The to come on line development in Far North Queensland will use Solar and Pumped Storage Hydro. I think there is a need to develop as many Pumped Hydro Storage systems coupled with Wind or Solar ASAP. Going down the Ultra Critical path i think is not the best way to go. Expensive and still has a carbon foot print. When Australia is blessed with such huge Solar resources please use it. There is without a doubt the capacity to totally replace at least 6 hours of daylight demand for electricity completely with zero energy cost power. To cut off the neck of the Duck Curve storage has to be put in place. To cut off the tail of the Duck Curve see above. In the meantime it would appear the best transition is going to use Gas Plants with the high cost outcomes to smooth the way until sufficient storage is put in place. In some areas battery back up is being put in place and this will become part of the picture. The end game is simple use the zero cost energy input Solar and Wind do the engineering to ensure all outcomes are covered. I have not included Hydro because do not think there are many more sufficiently large scale sites to take into consideration. Agree. Australia doesn’t have enough water to expand or rely on hydro. The drought in Tasmania highlighted this. Well, here’s the thing: Tasmania has 2600MW of hydro which is not of the pumped storage type and is run as a baseload power station. Wind in that state could have a capacity factor of more than 40% . So just by adding enough wind power and increasing the generating capacity of the existing dams 5000MW of continuous wind/hydro can be created – that is Baseload, add solar to that mix and this could be pushed to 6000MW, continuous, uninterrupted, never ending resource. Connect this to the wider grid and the Tasmanian resource, if used as a filler and peaking plant could potentially provide even more dispatchability. Another way to look at this would be to say Tasmania’s hydro can produce 2600MW x24x365= 22TWH of “stored” energy a year. 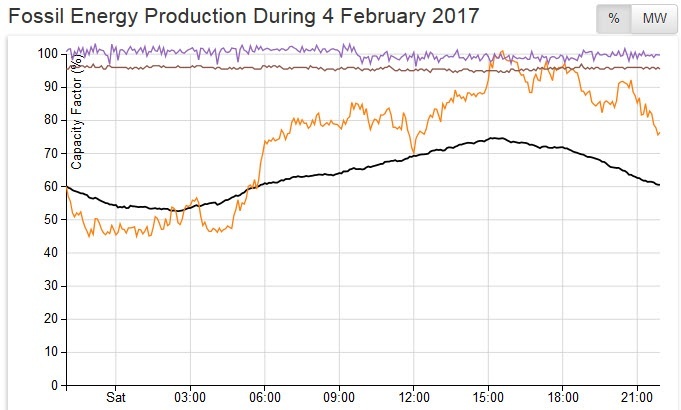 The snowy hydro has similar energy capacity. So Australia, with its meagre water resources, and using existing dams, and only increasing generating capacity can make its hydroresource worth at least 40TWH (a year) of dispatchability with a generating profile similar to batteries without any energy input to ‘recharge ‘ the dams. How many powerwall’s is that equivalent to? About 8million of them! 2003-04 was before Basslink, and Bell Bay PS was even oil-fired back then. The “significant storage capability” mentioned was two massive oil tanks next to Bell Bay PS. Bell Bay PS only had a capacity of about 230MW anyway, whereas the new gas-fired Tamar Valley PS has capacity of 370MW. Still, it’s Basslink that has completely changed the equation. The problem with not having Basslink was that if you overdeveloped renewable energy then the dams might get fuller and fuller over the years and eventually spill, wasting your extra renewable energy. Now with the existence of Basslink (even if it does go down from time to time) there is ample opportunity for renewable energy overdevelopment, with the hydro storages allowed to creep up over years, increasing their capacity to provide peaking power to the mainland a greater proportion of the time as they get fuller. ISTR Basslink going down after Tassie tried to send power back to Victoria. It’d worked previously but, IIRC, dam levels got too low to sustain the power generation in the absence of rainfall. Do I need to go and cite? It was only about a year ago. It demonstrably failed to meet the 2400MW x 24 x 365 picture painted as generating capacity. While Tasmania has the topography to substantially expand hydro storage, it won’t happen since a Dr Brown paddled about a river. Without hydro and Basslink drawing power from the mainland, Tasmania has to ration electrical power. Similar things happen on the mainland; even in places where the topography is amenable to hydro storage. And where the topography is favourable, the hydrology often runs counter to it with either inconsistent/”no” rainfall or no suitable sources and sink for pumped storage of the capacity needed to cover demand for long periods of dull and still days. Perth for example, regularly experiences dull period of negligible insolation running for 7 to 14 day; and irregularly up to 3 weeks. Often in mid-winter when winds are also low. There is little scope for the necessary power generation by hydro within a feasible distance. Hydro might be able to meet about 10% of typical demand; but then not all year round. A dry climate frustrates water storage through the summer where deep storage, with a useful, residual head isn’t viable. I agree that there is little more opportunity in this dry, flat land to develop new hydroelectric resources. Even Gordon Below Franklin (the one that Bob Brown apparently paddled past) would only have had a long-term average output of 185MW (about 15% of Tasmania’s long-term average output), and would have increased Tasmania’s potential energy storage by about 15% – mostly by putting Gordon Power Station’s water through a second (much lower head) generator. I understand that at one stage a second dam higher up the Franklin was proposed, but it is incredibly difficult to find modelled data on this dam – I’ve tried and failed for the last 15 years. The Franklin is the only remaining place in Tassie that more hydro development would be feasible – the Arthur river is too flat, and everywhere else is either too flat, too low, too small, or too dry. Last year’s power crisis was completely man-made by running the dams too low in the previous 3 years. Turning “cash in the bank” (water in the dams) into “cash” proved more important than fuller dams and more energy security and flexibility. If the dams were 70% full last January instead of 25% full or thereabouts, Basslink going down wouldn’t have even made the news. My point is not that hydro development could be the battery for Australia, but it could be for Tasmania (Basslink and Hydro already help the mainland with their peaks and troughs). About 1100MW of renewable energy capacity could be added in Tasmania without any difficulty at all (if one is to accept that for about 6-8 weeks a year when the run-of-the-river dams are spilling that some of this energy will be wasted). This is all without a $1billion dollar second cable to the mainland. Photovoltaic would be more valuable than wind MW for MW as the dams tend to spill in winter whereas PV generates most in summer. My other point is that the previous reference to the “Tasmanian Energy Supply Industry Performance Report 2003-04” is out of context and 100% out of date. A$1Billion for a second Bass-link is certainly a huge spanner in the works for any ambitions to create a Tasmanian hydro battery for Australia. The question to ask is what can we do with Tasmania’s hydro battery/ wind resource/ solar resource potential? I was only trying to point out that water can be a limited resource and over reliance is risky in drought times. Batteries are falling in price whilst improving in quality and commercial scale storage is beginning. I’ve great confidence in the CSIRO and Alan Finkel to map out our clean energy future. Hopefully no political games will be played. @Stalga, and also @Ian’s above reply to Stalga. @ Stalga, last year’s Tasmanian power crisis was largely man-made by running the dams at such low levels before the drought. 2016 wasn’t actually a record low rainfall year at all – it was a “Decile 1” year over the northern catchments and a “Decile 2-3” year over the southern catchments. It was very dry from July on, but we had good inflows in April-June. If the dams were being run at high levels before the “drought” and before Basslink failed, it wouldn’t have even made the news. @Ian – You’ve exaggerated Tassie’s hydro potential a little bit. Even though we have 2600MW of installed capacity, our long-term average output is about 1100MW. This is because that is how much rain falls. For example, if Gordon Power Station was not used at all, then Lake Gordon would take 3 average years to go from completely empty to completely full, and if Lake Gordon was completely full and Gordon Power Station was run flat-out and there was no rain, it would take 1 year for Lake Gordon to go from completely full to completely empty. The Snowy scheme has a greater installed capacity than Tassie’s Hydro scheme, but only produces about half the net power that Tassie does. (Snowy produces more power, but also absorbs a lot of power, because Tumult 3 has pumps, and so water gets pumped uphill every night and flows downhill every day). Again, this is because if Murray 1 and Tumut 1 were run flat-out, Lake Eucumbene would deplete very quickly. Still, the hydro is a bloody good “battery”. The only problem is that, although it is rechargeable, only the rain can recharge it. While I’m on the topic of batteries – there are 8 million households in Australia. If every house got a “Tesla Powerwall 2” installed for $10,000, the total cost would be $80 billion. (I’m not promoting the Powerwall 2 – I’ll be using the Chinese-made GCLs, but just for argument’s sake). This is lots of money, but is comparable to the figures being bandied about for inferior solutions. Hydro storage is also subject to significant losses from evaporation. Depends where, and on the characteristics of the reservoir. Here in Tas the only dam with net evaporative losses over a 12-month period (evaporation minus rainfall directly onto lake) would be Lake Trevallyn – all 8 square kilometres of it. Sure, a large area, shallow dam in a warm, dry climate loses significant amounts due to evaporation – think Lake Burrendong, Lake Dalrymple, and Menindee Lakes (none of these being primarily hydro). But deep, small-area dams in cool places lose much less. In Tassie the only dam in which summer evaporation would be significant is Great Lake, and this would only be about 0.5 metres, whereas its depth (if not used) would rise by about 5 metres in a year. Thank you for your better knowledge of the hydro situation in Tasmania and The snowy hydro scheme. The point is that the hydro- dam storage can be extended by installing sufficient or more than sufficient solar and wind capacity and then using those resources preferentially and saving the hydro for lean solar and wind times. Certainly distributed battery storage is becoming viable for the individual residence or business, but mostly as a time-shifting device. These installations will help homes disappear from the grid load, but only to reappear during prolonged cloudy days. This is were hydro can provide a large standby capacity function, simply by installing more generators and using them infrequently. The batting order for the resources access to the national electricity load would be distributed solar and batteries first – consumers will use their own resources first, then 2. wind and utility solar – these have close to zero generating cost, and have no storage function, any energy generated and not used is simply lost. Lastly hydro – any sane person will only run their batteries when other incoming resources fail. The value of these resources is hydro first and then the other renewables and should be financially compensated for its superior storage and standby function. Hydro could have sufficient nameplate capacity and water storage to run as the sole power source for days to weeks. Its dispatchable and standby function should not be compromised by the mundane day to day energy supply. This is all hyperthetical, but if you say Tasmania can produce 1100MW continuously, then surely it could produce a multiple of this amount intermittently. Everything you say is absolutely true and the authorities are (grindingly slowly) coming around to this way of thinking. The only thing I would add are that different storages have different value – some storages, if not used before the next significant rainfall event (especially in winter and spring), are likely to spill next time there is a big rain, so they might as well be used ASAP. Other storages (mostly Great Lake and Lake Gordon in Tas, and Lake Eucumbene on the Snowy) take years to fill and are at almost no risk of spilling, hence their energy in storage is of greater proportionate value. Tassie’s hydro will never provide a complete energy flux solution for the whole of Australia, but it can (and already does) shave 600MW off the peak power use of SE Australia by switching as many turbines as possible in the most expensive times and exporting it to the mainland. 600MW is a pretty big open-cycle gas peaking unit. The other thing about Tassie’s hydro is that renewable development in Tassie, despite its intermittence, is pretty much unrestricted by its intermittent generation nature. “The balancing component will require more flexible or firming capacity, not baseload”. Sounds like what BZE stationary energy proposed 7 years ago. The usual neoliberal gasping: pillage the public and public purse whenever possible… what a bunch of fools we have in power. Great article. However, I think it would be more accurate to include discounted running costs to Get an equivalency for coal v renewables in emissions reductions. If capital cost is $3100/kw for coal, then running costs over 20yrs might add an additional $200/kw p.a or $2000/kw in NPV. Thus investment would need to be $102b, which would increase the effective emissions reduction by 65% from your estimate. A bit like a computer printer, the printer is cheapish but the ongoing costs of the ink cartridges is expensive, so with coal and gas it’s the ongoing costs of the fuel that needs to be factored in. So much partial information on this site. The capital costs for Wind Power in Australia has averaged about $2,400/KW. So the 3,900MW of installed Wind Power in Australia has cost about $9.4 Billion. All that for a 30% – 35% Capacity Factor. So power supplied about 1,400 MW. Not base load and not 24/7/365 like coal fired power. Wind plants have an expected life of 20 years. Coal plants about 50 years. Coal plants generally have a Capacity Factor of about 85%. During January both Hazelwood and Yallourn have operated close to 95%. Wind and Solar can NEVER provide base load power. Nor the power that you want in your home and businesses, hospitals etc. That’s 24 hrs per day/7 days per week/365 days per year. Major Solar Plants in Australia have also cost about $2,400/KW. They have a capacity factor of 25% – 30%. It’s not just when the sun shines – the clouds also get in the way. Germany is using HELE technology on Lignite (same as Victoria’s Brown Coal). Coal fired power will always be cheaper than wind and solar. Why? because Australia has bountiful supplies of cheap thermal coal. Storage. Mankind has been trying to improve the humble battery for more than 100 years – with very little success. It’s all about economics and efficiency. Despite the promises there will be no large scale battery storage in our (those old enough to read this) life times. We’ve got large-scale battery storage down here in Tassie. It’s called the hydro-electric system. Works until there’s a drought. Works even better when there’s a drought – no need to worry about dams spilling (ie, power and money being wasted) due to their higher levels relative to what they would be if renewable energy was not part of the mix. When AGL et al won’t touch it … I did some sums based on the Turk plant in the US. To achieve Hazelwood’s output, investors would have to put up $AU6.3 billion, and all this for a “best before end” technology! Remember, the North Australia Development Fund has $AU5 billion, so, if the developers want Hazelwood’s output, they’ll have to find another $AU1.3 billion from somewhere. Also, the $AU5 billion will empty the coffers of the Fund, leaving nothing for other projects in the North. Incidentally, my favourite energy technology is Solar Methanol and Direct Methanol Alkaline Fuel Cells. The expression “clean coal” is a figment of “spin”. Any reduction of emissions is a product of improved turbine technology – expensive alloys that allow higher temperatures and pressures to be used without destroying the equipment. That’s fine, but the same old dirty coal is being used, it is not “clean”. In any event, it is likely that it is cheaper to install renewables rather than new high efficiency coal plants. We are being betrayed by our government. CCS has proven that it is very expensive, but Carbon Capture Utilization cost but a fraction to apply. It will remove over 90% of the CO2 out of the combusted coal exhaust and transform the CO2 into a useable – saleable product. Full time jobs will be created operating the CCS System as well as to a number of other industries. The amine that is used is produced from a plant that is grown in agricultural fields, and while it is growing it is absorbing CO2 from the atmosphere and putting it into the earth. There is so much more that can be recovered from the combusted exhaust, The heat energy can be recovered and used to heat and or cool commercial greenhouses in which food crops can be grown. More jobs, more saleable product. With the heat energy removed, water is created. If just 20% of the distilled water is recovered the coal power plant could be self sustaining. The recovered coal ash can also be converted into saleable products. More full time jobs created. Waste is not a waste if it has a purpose and we have created a purpose for combusted coal exhaust. If carbon capture costs “but a fraction to apply”. Why is there only one operating worldwide twenty years after it was first mooted? And why is the government not considering it? Because gas capture is highly problematic perhaps. That fraction equates to a percentage well north of 100. As for coal ash, why hasn’t any power plant done this already. Probably because it’s not cost-effective. Actually the ash can be used as a useful additive to concrete and can be used as a soil conditioner in agriculture Australian coal is reasonably clean in terms of trace elements in the ash. Very little smoke and ash escapes into the atmosphere, so in that sense coal can be clean, but it’s not the dirtiness of coal which causes problems it’s the enormous amount of CO2 being released into the atmosphere. Some of it can be used as a feedstock for various processes but there is just too much being produced. For every tonne of coal burnt there is 3.7 tonnes of CO2 produced. Yes, it’s mostly about the CO2. I’ve been paying attention to the climate data for several years now, I’m concerned. For agriculture, (I’m an old ag college graduate, I liked soil science), there are cartage and spreading costs to consider. The nutrient value appears fairly poor, calcium the exception. I note from a brief wiki search that pH levels can be all over the shop. Any acidic ash would be unlikely to be cost -effective. No comment on it’s use as a soul conditioner, I don’t know the particle size. Thanks for your posts in general, good input. The plants that have been trialed consume about 40% of the power generated in attempting to capture the CO2 – totally impractical. Clean coal plants reduce CO2 emissions by 15% to 50% depending upon the technology being utilised. Japan is going to build 45 x HELE (High Energy Low Emission) coal-fired plants – all burning Australian coal. Germany is going the same way (using lignite – similar to Victoria’s brown coal) as they have found the high dependence upon wind to be unmanageable. i.e. not just unreliable supply but unreliable voltage and frequency. Synchronous motors are very good at supplying stable voltage at a stable 50Hz. Thanks for your input, esp about CCS. I believe Denmark have overcome some hurdles regarding synchronisity. That supreme oxymoron ‘clean coal’ will undoubtedly be extremely successful at hoovering up vast amounts of public money. The French owners are closing the Hazelwood plant as not only has it been operated to close to it’s economic life but its ongoing viability has been severely impacted by the imposts of RET and LGC (Large-scale Generation Certificates). The LGCs alone add 9 cents/kwhr to the cost of coal and gas. Wholesale coal power is <5c/kwhr; gas is <8c/kwhr. To turn our back on 24 hr per day/7 days per week/365 days per year power is gross stupidity. Yep 24/7/365 is a desirable concept but CO2 emissions and global warming is not very desirable at all. No one says it will be easy decarbonising our economy, but it can certainly be done and done so well within our means. Pardon me, but you are being a little disingenuous looking at what has already been spent on renewables, considering that prices have dropped so dramatically. The number of LGCs Hazelwood is required to purchase is zero. 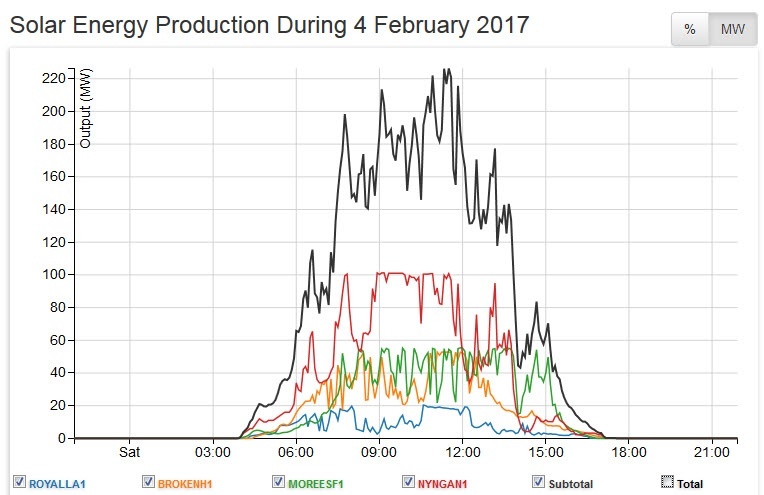 This plot is from Aneroid Energy’s site yesterday (4 Feb) and shows the power outputs from the 4 main solar plants which feed the Australian East Coast Grid. Obviously all of these sites – despite their geographic spread – were effected by clouds. Stable power generation at 60% of the installed capacity for 4.5 hours. Perhaps someone here can explain how this production profile can ever be considered base load power for Australia or even small towns. 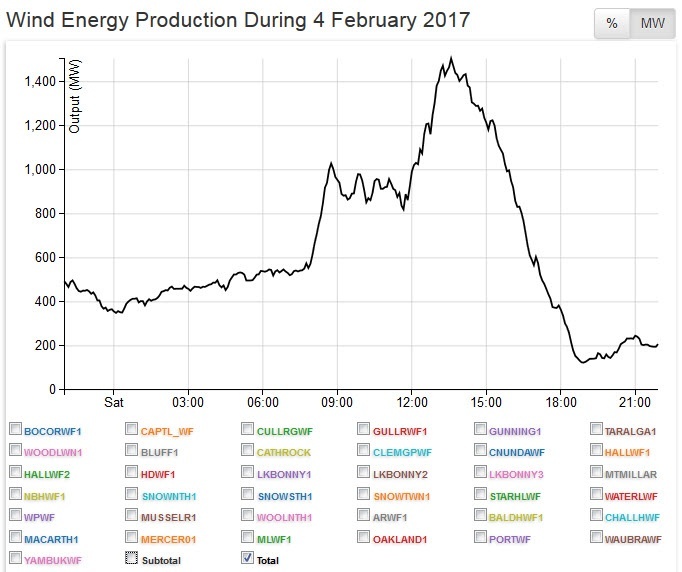 This plot is from Aneroid Energy’s site for yesterday (4 Feb) and shows the total power output for all wind generators feeding Australia’s East Coast power grid. Total installed power is 3,900 MW. Remainder a mix of the above. Peak instantaneous power at 40%. Obviously the wind isn’t always blowing somewhere to smooth things out. Plot available from Aneroid Energy’s site for 4 Feb. The benefits of coal fired power for base load power supply. Australia has installed fossil fuel capacity of 38,000MW. Being only a Saturday only 24,000MW was required. Bayswater 2 (Orange) variable to match the demand curve. Increased at night to cover when wind and solar are unavailable. The Total Power (Black) shows the normal 24 hour supply/demand curve. (In this case for a Saturday). Week days have been operating up to 28,000 MW. Without large scale battery storage (yet to be developed but promised for decades) wind and solar is unable to match this demand curve. 50% renewables for Australia, with current technology, by 2013 is simply neither practical/achievable nor an economic burden that Australia consumers (business and private can afford). A nuclear plant’s output would look the same as the Yallourn or Hazelwood plots – 24/7/365. Now that’s a good return on the capital invested. Grid scale battery storage exists and is being deployed in California at the moment. South Australia is setting up one at the moment too. You wont find too many technical comments/responses from this lot mate. They don’t like pragmatic approaches here. They know coal is black and “dirty/bad”, and like to approach the issue of global warming from an impractical and ideological point of view (ie transition away from fossil fuels as soon as possible, even though an alternative equivalent renewable energy technology isn’t there yet). They like their new whizz bang home battery systems and PV cells and like to big note and say how their systems saved them $300 last year and everyone else without a $25,000 system on the roof is a fool, and that’s about it.. They are happy for the Government to subsidise and spend money on grants and schemes and subsidies (they love the PFiT) for renewables and ignore the practical aspects and of getting renewables to provide baseload power generation (especially for high electricity intensity industries). Every article you read here about large scale solar talks about ‘plummeting costs’ to produce solar electricity but they gloss over all the subsidies and the battery systems required to support baseload power generation. Then they are the first ones to jump in and point the finger at any other technology such as carbon capture and storage that would actually provide a transition to a lower CO2 economy while still providing reliable baseload power generation. BNEF aren’t Consulting Engineers, are they? Are they licenced investment advisors? So they suffer no dire consequences for providing advice that turns out to be junk and damages those who accept the advice. How much is BNEF “advice” really worth if they have no responsibility for the quality of the advice? While CCS is definitive crap; in Engineering and Economic terms, technologies such as ultra-supercritical steam allow for much more efficient combustion of coal, reducing the total amount of coal required for the same amount of energy generation. Australia, had it begun converting to such HELE (High Efficiency, Low Emissions) technologies in the 1990’s would have met the Kyoto emissions reductions goals by now; without casting cities into blackouts and ruining energy-intense industries that power tens of thousands productive jobs directly; and perhaps a million in supporting industries. CCS requires about 30% more coal to be burnt in order to theoretically capture all the CO2 from combustion, clean, compress and pump it “somewhere”. While CCS “works”; it does not scale to the solve the purported problem. CCS proponents may only be interested only in selling more coal. The only technically viable energy generation technology for energy intense societies like Australia’s is nuclear power. Dr Alan Finkel is a proponent of nuclear power. Coal is more acceptable than nuclear power by radiophobic society Australia. “CLEEEEEEEEEEEEEEEEEEEAN COAL”…say it again “CLEEEEEEEEEEEEEEEAN COAL”, it just rolls off the tongue so beautifully. Like Dr Finkel has said about opening your mind too much…the brain just seeps out.